The Californian hip-hop star, who caused a furore by pledging to "murder" his competitors with a verse in Big Sean's song Control (HOF), made no reference to his combative lyrics, choosing to focus on his fans during his set instead. The 26-year-old opened with The Art Of Peer Pressure, before playing songs from his albums Section. 80 and Good Kid, M.A.A.D City at the Roundhouse in Camden, with numerous shout-outs to his fans. He told the crowd: "Everyone here knows I couldn't do this without my day one fans. Some of my most dedicated fans right here, am I right?" Just before his hit song, Swimming Pools, Kendrick encouraged everyone to have a toast and to take "at least one sip with me". He ended the concert, saying: "No matter how big I get, no matter how small I get, I'll always come back to you." Kendrick, who will open for Kanye West's Yeezus tour in October, is the latest act to take to the stage for the month-long event. Sir Elton John, Kings Of Leon, Arctic Monkeys and Jack Johnson are among the stars who have already performed since Lady Gaga opened the festival on September 1. Katy Perry will close the series of live shows on September 30. 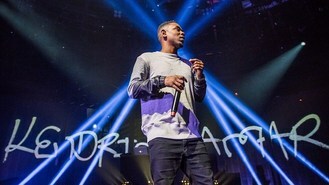 Kendrick has explained that the lyrics are about his ambition, telling US radio station Power 106: "A lot of people think it's about talent, that's where they get it wrong. I'm saying I'm the most hungry."